We need a new kind of climate leadership. 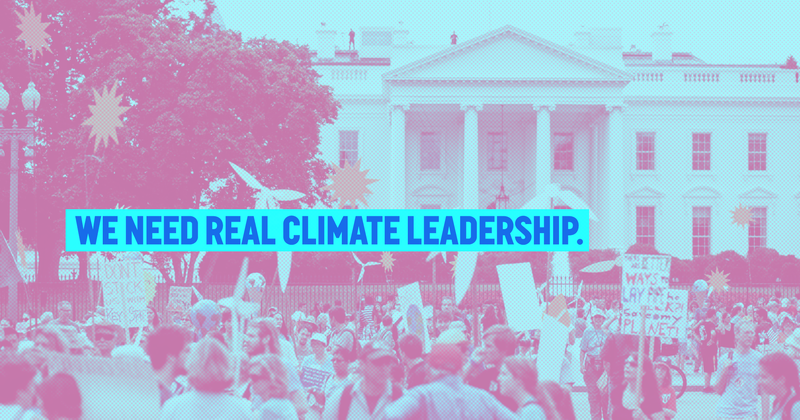 Our next president needs to be a real climate leader. Watch to see how the climate movement is keeping score—then, take action. From Washington to Nebraska to Florida, some of this year’s most important races were climate hotspots — where climate change was very much on the ballot. Follow 350 Action and 350.org on social media to stay up-to-date with the latest news from the climate movement. It’s time to end the climate silence in 2020. We need a climate debate. 2020 candidates: we’re keeping score. Democrats took back the House. Now, it’s time for action. Real climate leadership means passing visionary policy solutions like a Green New Deal and standing up to big polluters. We elected dozens of climate champions and sent a clear message of resistance to Trump and his fossil-fueled cronies. Now, let’s make it clear to our new members of Congress that we expect real leadership on climate that puts people before Big Oil’s bottom line.